Not one to rest on his laurels (or rest on anything at all it seems), Dale will soon set out on another momentous trek. In 2017, he aims to become the oldest man to have ever thru-hiked the Appalachian Trail. The current “oldest thru-hiker” title holder, Lee Barry, was 81 when he completed his record breaking journey on the AT. Dale will celebrate his 82nd birthday on the trail this summer. His new motto is adventure starts one step at a time. Harmony House will be with Dale every step of the way on his journey (in his food bag at least). 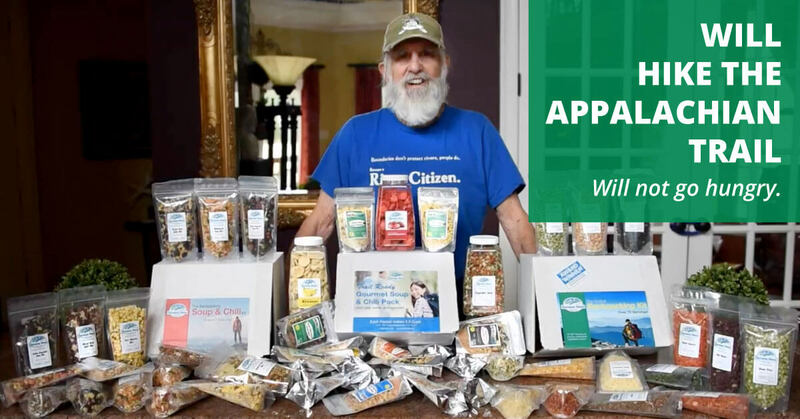 We are excited to announce that Harmony House Foods will be sponsoring Dale Sanders in his inspiring attempt to become the oldest thru-hiker ever. Dale will be taking along a variety of our premium dehydrated vegetables, dried fruits, and gourmet dried soup and chili mixes for his backpacking meals and snacks. We talked to Dale just before he set out on his journey, thru-hiking northbound on the Appalachian Trail. Harmony House Foods: Wow, Dale! You are on the go—non stop. It’s amazing! Dale Sanders: Well, when you get to be 81 you keep going nonstop, otherwise you might never get started again (laughs). How have you been training for your thru-hike? I have been trying to do hills here in a state park near Memphis. It has some great hills in it—I am talking an incline of 45 to 50%. So it is fantastic training for the AT. I’m a firm believer that, when training, the exercise you do to get ready for an expedition should be what you are going to do (in the expedition). So if I’m going to paddle, I’ll paddle for exercise. If I’m going to hike, I’ll hike to get exercise. Have you been testing out some of the foods and meals you are going to eat on the trail? Oh yes! Harmony House foods are fantastic. I’ll tell you right now, if people aren’t eating Harmony House foods, it must be because they aren’t aware they exist or haven’t tried them yet. Those strawberries are amazing! The bananas are just fabulous. Have you been making up your own recipes using the ingredients? Yes, my wife and I have been making up recipes. There are so many combinations I can’t possibly get to them all, but I am in the process of pre-mixing some now ahead of time so I don’t have to carry everything—even though those packages only weigh a couple of ounces! So I’m doing a lot of testing, my wife and I are. You are planning to do food drops along the way? That is correct. I think I’ve got all my drops set to keep me in food supply all the way to Maine. So you’ve got your miles for the trip plotted out? The first quarter of the trail is plotted out in detail. That gets me through there, through to your neck of the woods (in Western North Carolina) at Winding Stair Gap. Through there I’ve got planned in detail. I will do more planning as I move up the line. What’s your plan for average daily mileage? I am hoping to average, on the entire trail, 15 miles a day. You raised over $23,000 dollars for awareness funds to help fight Type 1 Juvenile Diabetes during your Mississippi River paddle. Are you fundraising again during your AT trip? Yes, that was a fantastic campaign that my sister Judy ran on my Mississippi Source to Sea trip. My primary mission is not to raise funding for Juvenile Diabetes on the AT, but many people have been wanting to donate so we do have a link on my website that people can go to to donate to the organization to support research into finding a cure. How can people follow along with your progress on the AT? I have a link on my website to my SPOT Tracker. On the homepage, I will have a button there by the 14th of March that says Follow Me on SPOT. SPOT will be with me everywhere I go. Any age person needs to carry something like SPOT with them out on the trail in case of emergency. You will be celebrating your birthday out on the trail this year in June. Are you planning anything special? I’m not, but I hope somebody else does (laughs). I’m going to be literally too busy walking and my access to the internet is going to be limited. The only thing I’ll have with me is a cell phone. So I’m not going to plan a lot of big functions while I’m on the trail, but I’m sure there are people who are going to keep up with me who are probably going to do something. Hopefully surprise me with a gallon of ice cream. If all goes according to plan, when will you summit Katahdin? If I average my 15 miles a day, I’ll finish in late September. Of course I am going to have to finish by the end of the first week of October because the chance of snow is so high after that. If it snows, you can’t go in anymore to Katahdin. I think the park will officially close on the 22nd of October. It usually closes way before that because of snow. Have you thought about what you are going to do to celebrate? Yeah, I’m going to get up there by that sign. I’m not going to take any alcoholic beverages, but I’m going to go up by that sign and do a victory dance. You are such an inspiration, Dale. How do you do it? What is your secret? (laughs) Well, they both kind of go hand in hand. I really believe there are three things you need to do. If you do these things, the chances are much greater that you are going to live a long and healthy life. If a person lives happy, and they really in their heart are happy, their chance of living longer is much better. And I think, number two, a good spiritual life. That goes really hand in hand with being happy and being fulfilled. Having a good spiritual life—with family, friends, God, and relationships. And of course the third one, which is extremely important, is to remain active. And when I say active I’m talking about really exercising. You know that expression No pain, no gain? I am one to believe that if you really want to stay in physical shape, you are going to have to go out there and work for it … and reach the maximum of your physical ability, and then reach for more. And I think that if you’ve got those three things, your chance of living a life that is long, healthy, and satisfying—in my opinion—are much higher. Harmony House Foods is proud to support Dale Sanders in his bid to thru-hike the Appalachian Trail. Stay tuned. We’ll be checking in with him along the way. Good luck, Dale! Safe Travels! To learn more and follow along with Dale, visit greybeardadventurer.com.